Removing obstacles is a significant step in any painting job. 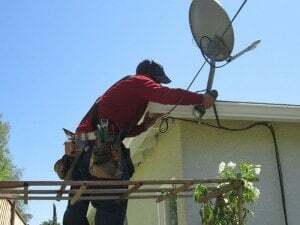 Painting gutters is easier when the gutters are removed from your home, but removing an entire gutter system is not always practical. Downspouts, however, may be removed, and small sections may be removed (i.e. a previously damaged section). If you’re painting the entire system, you’ll likely find you can still do a good job of painting the gutters while they are attached. Gutters need to be completely cleaned before painting. Pressure washing alone won’t be adequate. After pressure washing, often a residue is left behind that can cause your paint to peel and bubble after being exposed to excessive rain or heat. After pressure washing, or instead of pressure washing, use a bucket of warm water along with a generous portion of dish detergent, a big sponge, and a bristled scrubbing brush. Using circular motions, scrub your gutters to loosen the dirt, then wipe it away. After the gutters are clean, check them for any scratches that could catch on the paintbrush and cause streaking. Use aluminum oxide or silicon sandpaper to sand down these areas. After the gutters are sufficiently clean and smooth, it’s time to prepare them for painting. When painting aluminum gutters, it is imperative to use clear acrylic bonding primer, which is available at any major hardware retailer. On a sunny day, wait at least two hours after cleaning to begin coating the gutters with primer. Within 48 hours after the primer has been added, you’ll need to add an oil-based high-gloss enamel to the gutters. This is necessary to ensure a surface that is conductive to the flow of fast rainwater. Once the first coat has dried, apply a second coat. After two hours on a sunny day, the enamel should be dry. Once this happens you are ready to apply the paint. The paint used should match your primer, so be sure to check with your hardware store when buying the paint to make sure this is the case. The paint should be a high-quality 100% acrylic paint, and should not have ammonia, as ammonia can react with aluminum. Once you’ve decided on the paint, next you’ll need to decide whether to use a sprayer or a brush. This choice is simply a matter of preference. While spraying may sound easier, if your gutters are still attached when spraying, it can be difficult to protect the rest of your home from excess paint. Spraying therefore can involve a lot of tape and cardboard to mask the undesired areas. Another thing to watch when painting is the weather forecast. Check that there is zero percent chance of precipitation, extreme heat or extreme cold, as any of these could have disastrous consequences for all your hard work!